Mastering the intricacies of post-processing can raise the level of your photography and turn good photos into awe-inspiring imagery. Adobe Lightroom, the industry-standard software for organizing, editing, and presenting your digital photos makes your photography workflow, easier, faster, and more manageable. 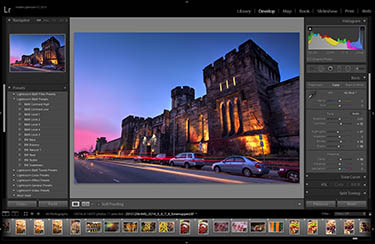 In this classroom style setting workshop led by one of our experienced Lightroom educators, we’ll cover the basics in a broad overview of the major modules of this program’s expansive offerings. The Develop Module: Adjusting exposure, brightness & contrast, color correction, sharpening, noise reduction, white balance, cropping, and how to us Lightroom’s selective adjustment features. Students must have a working knowledge of their camera and basic computer operation in order to get the most out of this course. We’re located in the Foxshire Plaza on Fruitville Pike where there is ample parking in the shopping plaza’s parking lot right in front of the store! Up to 7 days prior to the start of the class you can cancel with a full refund or reschedule for the same class from the list of available upcoming dates. From 6 days prior to 48 hours prior to the start of the class there are no refunds, but you can reschedule the same class from the list of available upcoming dates. Less than 48 hours prior to the start of the class there are no refunds or opportunities to reschedule without a new registration fee. If Perfect Image cancels the class for any reason participants can receive a full refund or choose to reschedule for a comparable upcoming class.